Wylie Thunder Road is dedicated to good, clean fun for all ages. By reserving time for your school or church group, at least a day in advance, you can take advantage of these great specials. *Universal tickets are good for go-karts, bumper boats, Laser Maze Challenge/Beam Buster, Euro Bungy or mini-golf. The tickets can be used for single or double karts or single or double boats. This is only available 8-10 pm in June, July, and August; May & September times are flexible. Participants are welcome to take part in the go-karts, euro bungy, bumper boats, laser maze/beam buster, and mini-golf. 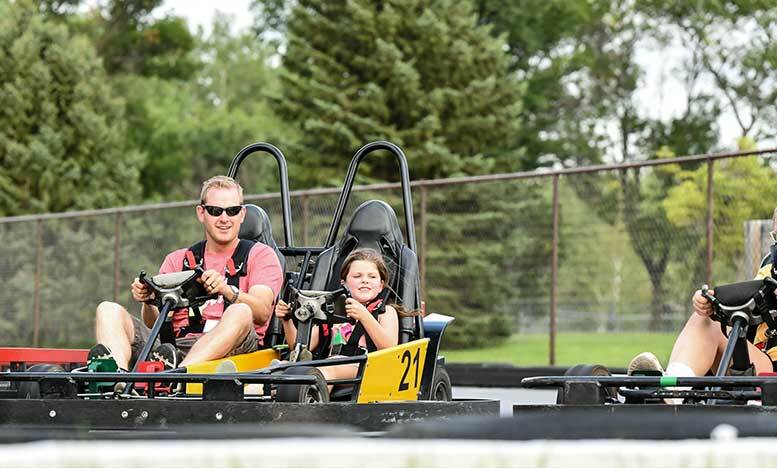 $15 per person for a go-kart and bumper boat private party. Private parties are before or after hours. You can add Euro Bungy, mini-golf, or Laser Maze/Beam Buster for additional charge. Party length depends on number of people in group. For a school or a church party please call Wylie Thunder Road in Aberdeen, SD at (605) 225-8541 to see if your date is available or fill out the form to request more information. Call Us at (605) 225-8541 or fill out the form below to get started booking your event!